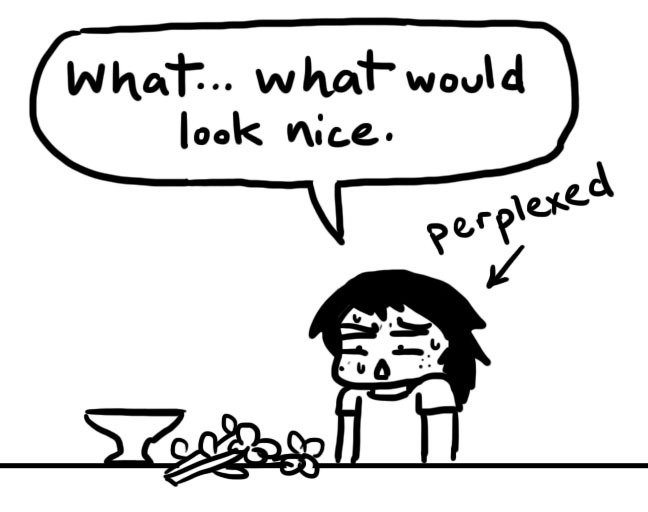 Putting flowers in vases is actually a difficult process | I think in comics. The internet here is very variable… I apologize. I haven’t been able to access internet for the last four days. But I’ll try my best! My group is in Sapporo now, where we’re actually doing the real learning part of our trip. In Tokyo and Kyoto, we mostly ran around trying to visit every attraction possible. In Sapporo, we’re actually going to class every morning. (3 hours straight!) Afterwards, we go out to experience more Japanese culture, and then in the evening we speak with various Japanese conversation partners. In other words… we’re still ridiculously busy. One of these “cultural experiences” was ikebana, (生け花, literally putting life into flowers) the Japanese art of flower arrangement. 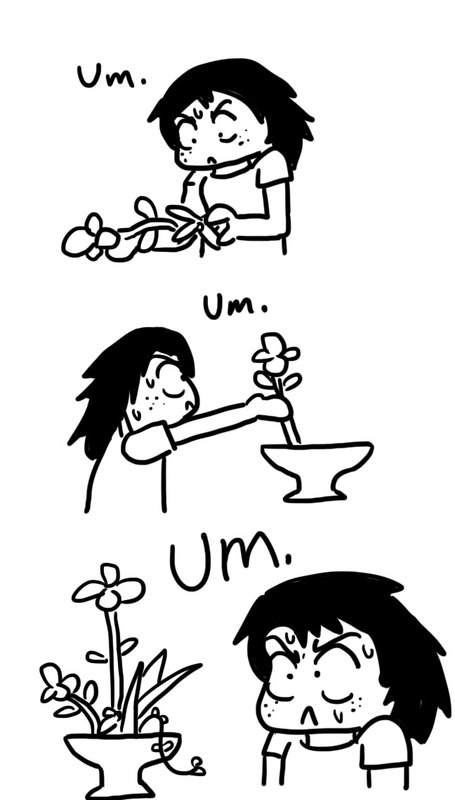 Basically, you put… flowers… into vases… so that it looks nice. There’re actually several different styles and rules, with the composition depending on the shape of the vase, the season, and the flowers available. It’s more difficult than it sounds. At our host university in Sapporo, we attended an ikebana demonstration with one of the professors. She explained the basics of ikebana, about how it needs to be an asymmetrical triangle, needs to suggest 3D space, and is meant to be viewed from only one angle. Of course, this was all in Japanese, so I understood about… zero. Then, each student was given a vase and a bunch of flowers to have at it. Now, I understand these concepts now—after I had our sensei translate for me—but at the time, I was perplexed. Well, whatever. I had at it. 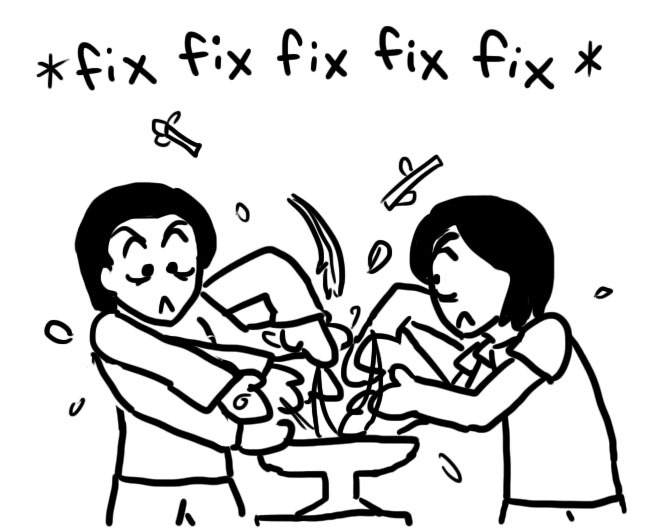 She started trying to fix it. After a couple minutes of frantically trying to revise my ikebana, she finally had to call over the other ikebana sensei. So for the next five minutes, my ikebana received the full treatment. And then I had a huge case of déjà vu the next day when we tried shodo, the art of Japanese calligraphy. Oh my gosh, this is hilarious! Poor Vy. XD Your calligraphy looks gorgeous, though! Just amazing. Really you’re a comic addict like me. I enjoyed your posts. Thanks for your work and posts. i miss you vy!!!! and your comics are a hilarious window for me to see you through!~**! Glad you could enjoy it! omg, your character for 愛 is so good! I wish I could do calligraphy like that! 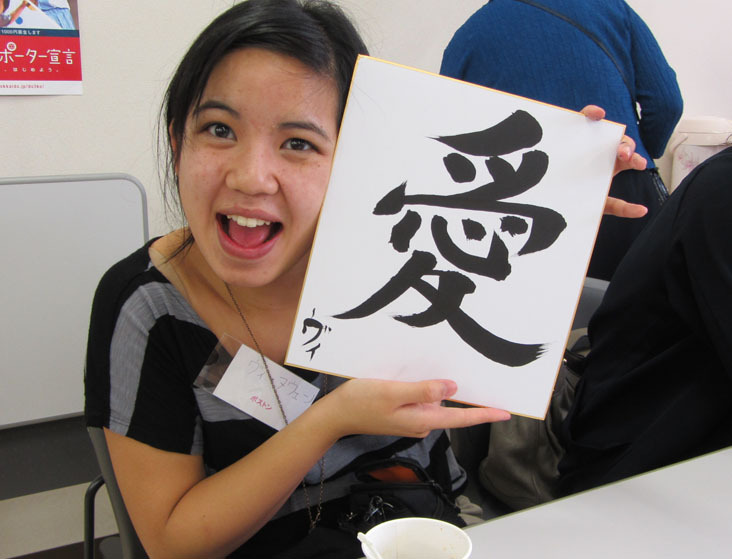 When my family hosted two Japanese girls in 2005, they brought calligraphy signs like that too! Haha thanks! I had to have the instructor coach me for about an hour before I got it, though. Practice makes perfect! Very funny ikebana description! I return to classes next month and I have been there too. I still feel like I keep doing the same arrangement over and over. I think that it’s going to take me a long time to get it. That vase you had is not an easy one to work with and those and not the easiest flowers either. Too funny though! Love that it’s a comic.